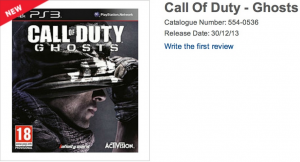 Last week UK retailer Tesco accidentally leaked information about the next COD title, Call of Duty Ghosts. In yet another slip up they’ve revealed more information including the Call of Duty Ghosts release date. Tesco Direct, the popular online service for the UK retail giants, has republished an article that was previously removed after leaks regarding Call of Duty Ghosts came to light. Not only is the new post on the same page as its predecessor, but there’s also far more information available this time round. So if the listing is to be believed we can expect a brand new story populated by new cast members and more importantly, a brand new next-generation game engine. A further leak was posted on a Spanish retailers website which featured similar information. If the leaks are to be believed we can expect Call of Duty Ghosts to release on November 4th for Xbox 360, Playstation 4, Wii U, PC and the Playstation 3. What makes the release date more interesting is that the original leak placed it at December 30th 2013, a common placeholder for currently unannounced release dates.